The Niebaum here is from Mr. Gustave Niebaum, the founder of Inglenook back in 1879. Coppola is Francis Ford, famous movie producer. Founded in 1978, Coppola purchased the Niebaum residence and some vineyards. Adjacent to this property he purchased some 120 acres of vineyards. In 1995 he bought the Inglenook property, across the street from Beaulieu Vineyards. This was owned by Heublein and came with another 70+ acres of vineyards. Also part of the package was a bunch of wine. The original wine made here goes by the name "Rubicon." A South African winery also makes "Rubicon," by the way. Rubicon has been a Cabernet-based blend. The first vintage was 1978, though Coppola didn't release this until the mid-1980s. It was a bit rustic and astringent. People bought it anyway, curious to taste what Coppola could produce in the vinous world. Over the 1980s the wines continued to be of this somewhat rustic, harsh, more-tannin-than-fruit style. I remember tasting a whole line-up of these when they were about 10-15 years old and finding them to be somewhat dried out and short on fruit. I suppose Mr. Coppola felt a need to improve and he hired Tony Soter (Spottswoode, Viader, Etude, etc.) some time ago. Bingo! Instant improvement. Soter helped craft the wine to have much better balance and significantly more fruit. These also show a nice sweet oak note. His fingerprints remain, though I am not certain Soter still is affiliated with Niebaum-Coppola. The 2006 is a full bodied Cabernet, showing some ripe tones and a whiff of wood. It's drinkable now and should remain in good condition for another 5 to 10 years. The winery offers a bunch of wines with the Coppola name on them. We have found these to be fairly commercial and of little interest. As we get requests for something with the Coppola label, we carry a red wine called Claret. It's a decent bottle, but hardly spectacular wine. The winery has a small sign out in front noting "American Owned". Old Uncle Mario's family had been in the California wine business for years. Look in any book covering the wine scene in the early part of the 1900s. The history is fascinating. Mario, who passed away at the age of a hundred-and-something in late 2010, lived up the street from the shop and he'd had a small cellar in Napa making Cabernet. It's 100% varietal. Oak is not a big part of his wines. They feature the grape. The quality is good and the pricing is imminently fair. Mario was a friendly old fellow who was even more of a dinosaur than are we! His wines are not going to win tastings, but enough restaurants around here have his Cabernet on their wine list that the wine is rather popular. People like the Cabernet because it tastes good with food and doesn't cost a fortune. The 2015 vintage is a medium-full bodied Cabernet and is drinkable now and should remain in good shape for 4-6 more years, maybe more. It's a bit of an old-school California red wine, not the currently-fashionable fruit bomb with noticeable (and bothersome) levels of residual sugar. Still, it's an impressive Cabernet for twenty-bucks. Mario made a reserve wine and named it in honor of his late wife, Miriam. I think she was an avid swimmer and so there's a small icon representing her on the label. The wine is quite different than Mario's regular Cabernet. It was matured for about two and a half years in French oak, all the cooperage being brand new. The resulting wine is deep and dark. It's from the 2001 vintage, so it's had considerable bottle aging. 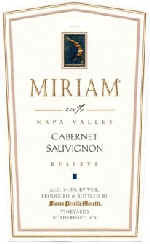 The 2001 Miriam is now "history" and we thoroughly enjoyed that wine...lovely work! And we'll miss Uncle Mario...he was a character and a treasure. His grandson Andrew now runs the business and we hope he's got big feet, because Mario had big shoes. You may not be familiar with the Meyer Family Cellars wine, but it's likely you've tasted wine from their "old" winery. Justin Meyer was a founding partner with Raymond Duncan in a winery called Silver Oak. Meyer had been working at the Christian Brothers winery way back and Duncan was able to fund their launching of a new brand of wine called Silver Oak. They also collaborated in starting a winery called Franciscan Vineyards. a tip of the cap to the Christian Brothers winemaking enterprise. Meyer retired from Silver Oak in 1994 and sold his share of that winery to the Duncans in 2001. He had bottled a dessert wine under the Meyer Family label and we can't recall precisely when the first bottling hit the market, but it was in the late 1980s or early 1990s we believe. Justin Meyer passed away in 2002 at the age of 63, but his son is at the helm of the Meyer Family Cellars winery. The Meyer Family Cabernets are a bit different from the Silver Oak style. Meyer Cabernet is matured in French, not American oak. The main perfume of Silver Oak Cabernet comes from their lavish use of American oak barrels. We like the 2014 "Fluffy Billows" Cabernet, a wine from the Oakville appellation in the Napa Valley. The wine shows dark fruit notes with a touch of ripeness, but it's not jammy. There's a mildly woodsy quality from the wood aging (half the French oak barrels were brand new). It's quite enjoyable presently and you could cellar this if you like for another 5-10 years. We were one of Mr. Phelps' first customers back when they released their 1973 vintage wines. This was the "new, cool" winery in Napa and the wines were "must haves" back in the day. Joe Phelps owned a construction company with an office here in Burlingame, so he was well-known to us from the start. Mr. Phelps was a home-winemaker back in Colorado. What with being in the Bay Area, it made sense that he might take the plunge and try making wine under his own label on a professional basis. Back in the early 1970s there were only a few wineries in Napa and vineyards were interspersed between fruit orchards and cattle ranches. The property Phelps had his eye on was near Heitz Cellar on Taplin Road. It was owned by an old cattle rancher and he was not much interested in selling the property and having someone come along and bulldoze the place to plant a lot of concrete and cement. Phelps appreciated the fellow being somewhat of an environmentalist and he promised that he'd build a winery which respected the nature of the property. 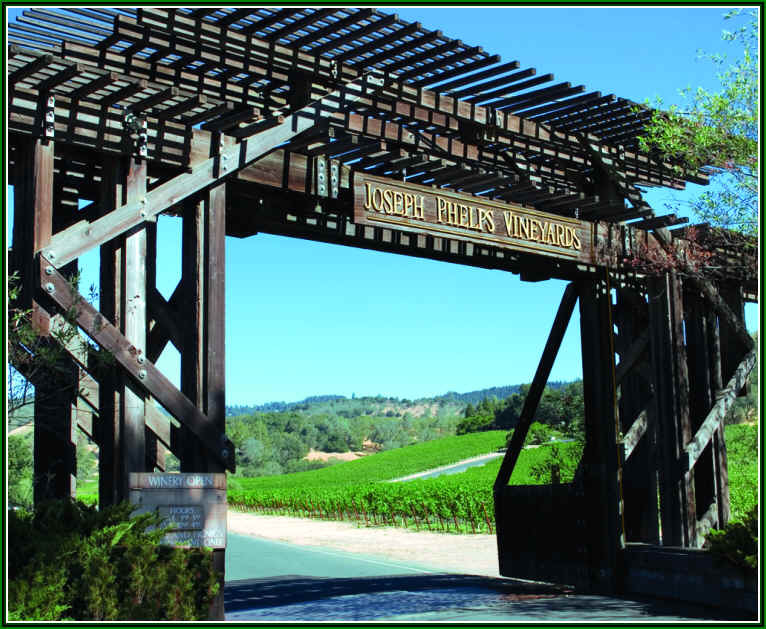 The fellow eventually said "okay" and in the early 1970s Joseph Phelps Vineyards became a reality. At the outset, Riesling was a specialty, as the winemaker back then was of German origins, Walter Schug. He was most interested in producing Pinot Noir. The winery also made a name for itself with some Rieslings. Phelps discontinued Pinot Noir in the late 1970s, so Schug started making his own with Phelps' permission. In the early 1980s, though, Schug departed to launch his own winery in Sonoma and Pinot Noir was a specialty. Curiously though, he didn't continue making Riesling. 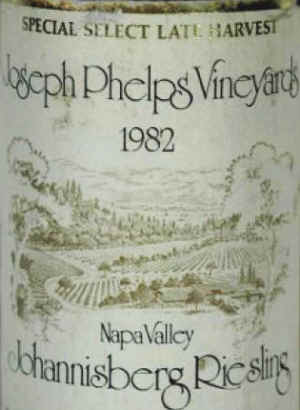 Phelps made some pleasant Cabernets in those early days, but these were not viewed as especially outstanding. We recall those early vintages were not consistent as Phelps was purchasing fruit from growers around the Napa Valley and these farmers may have been more interested in tonnage than anything else. Some of the first vintages were a bit herbal and maybe under-ripe. In 1975, though, they launched a wine called "Insignia." It was a blend of whatever the best barrels in the cellar were. The blend varied from vintage to vintage, but it was a pretty good bottle of wine and one of the first "Bordeaux Blends." Back in the 1970s, we would get in the van and drive to Napa to pick up some wines and taste out of barrel, as well as previewing new and upcoming releases. We had called and ordered a couple of cases of Phelps' Pinot Noir from the Heinemann Mountain Vineyard. Computers were new-fangled gizmos back then and when we arrived at the winery, the only guy who knew how to operate that device was away from the cellar. His name was Bruce Neyers. Yes, the same Bruce Neyers who launched the Neyers brand of wine and who has been associated with Kermit Lynch Wine Imports as its sale manager. We were a bit frustrated when the would not part with a couple of dozen bottles of this wine because nobody in the office could figure out how to use the computer. A few weeks later were were planning to go pick up wines again in "The Valley" and called Phelps to order the Heinemann Mountain Pinot Noir. We made some remark to whomever was answering the phone that we'd appreciate if they'd have the order ready for us as the last time they could let us take the cases due to the compute issue and we were a bit pissed off over this. A day or two later the phone rang and the voice said "Mister Weisl, this is Bruce Neyers from Joseph Phelps Vineyards. Mr. Phelps is listening on the other phone here. Say, we wanted to ask you a question. Did you say you'd be 'pissed off' if the wine order wasn't ready?" "Yes, I think that's pretty accurate." "Well Mr. Weisl, how'd you like it if we called your store and used such language with your wife?" I said that sort of talk was fairly tame. "Mr. Weisl, I'm afraid we don't want to sell you any of our wines if you're going to speak like that." Wow...stunning. I'm sorry Mrs. Phelps had such tender ears. You'd think people who owned a construction company and had big, strapping builders would be accustomed to hearing their employees using far worse language when whacking their thumb with a hammer as they're nailing two-by-fours together. We wondered if Phelps insisted they refrain from any sort of profanity and exclaim something like "Oh Sugar!" when missing the nail and hitting a digit. Of course, in those days there was a slightly more gentile protocol for language on the radio and TV. These days you'll hear people say "A-hole" and "D-bag in so-called polite company. We dialed the Phelps winery and asked to speak with Bruce Neyers. "Bruce, are you still pissed off at me or can I come pick up some Pinot Noir?" We were able to buy the wine. And Bruce, who is an ex-Marine we believe and who has a way with words said he thought we were "More nuts than a f#@%ing bunny." Mr. Phelps, bless his tender heart, passed away in 2015. But he was quite an innovator. 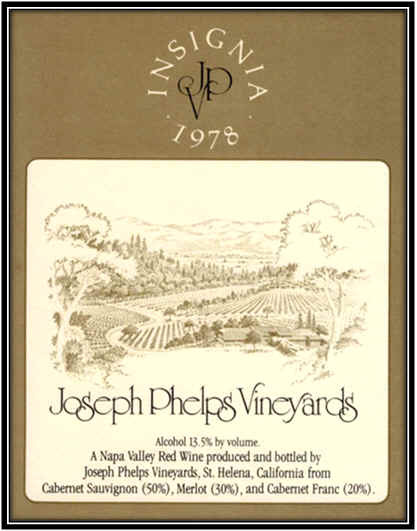 Aside from creating the Insignia wine, Phelps was a leader in dabbling with Syrah and other Rh�ne varieties. Early Cabernets were promising but not stellar. They launched something called Insignia back with the 1975 vintage. The wine was going to represent the best barrels in the cellar and some early vintages were predominantly Merlot and others were mostly Cabernet Sauvignon. These days it's a Cabernet-dominated blend. And it's now established as a benchmark for Napa Valley Cabernets and Bordeaux-styled blends. Insignia is a wine showing lots of dark fruit and plenty of wood. Some vintages may even have a tiny bit of residual sugar. The "regular" bottling of Phelps' Cabernets are perfectly pleasant and typically of good quality. We thought the current vintage measured up to about a fifty-buck bottle, but would have had to sell for nearly $70. No thanks. Phelps has bought fruit from the Backus Vineyard since the 1977 vintage. When the Backus family wanted to sell the entire vineyard site, Phelps stepped up to the plate. This is a special vineyard in Oakville along the Silverado Trail. The original vineyard covers less than seven acres, but Phelps says there are about 21 acres which can (and are) being cultivated. Neighbors to this vineyard include Screaming Eagle and Dalla Valle, amongst others. We had a mid-1980s bottle of this at the Vino Fino holiday dinner in December of 2000 and this was a sensational bottle of wine! Very exotically-perfumed. The flavors were amazingly deep and lengthy. It's been great to see this producer emerge in the past decade as a truly serious quality winery. Sir Peter Michael is a royal subject of the Queen of England and he's got a nice little winery and vineyard here in California. A venture capitalist, this fellow has his fingers in the operation of radio stations around the planet, along with a couple of luxury hotels (they refer to these as "restaurants with a room"), a golf course and, oh, by the way, a little winery in Sonoma. The first winemaker here was Helen Turley. She's one who has strong ideas about winemaking and viticulture. Typically she is affiliated with a winery for several years and then moves on, leaving a disciple in her stead. The Turley-ite here was Mark Aubert, who departed to start his own winery, but has since returned on a consulting basis. The winemaker today (they've had a bunch of people) is a French fellow, Nicolas Morlet, whose family owns vineyards and makes sparkling wine in the region of Champagne. The Cabernet here is sold as a proprietary vineyard blend called "Les Pavots." This vineyard site was dubbed "Les Pavots," by Sir Pete's wife, Lady Maggie. This refers to the wild California poppies growing around the vineyard. It comprises some 23 acres and is predominantly Cabernet Sauvignon along with Cabernet Franc and Merlot. We've long been fans of this wine (since before it acquired its somewhat cult-like following). The wines through the 1990s have been really good, but with 2001 and now 2002 the use of oak gives the wine a sweeter fragrance and flavor. It scored a high numerical rating from various point-scoring critics and this has increased the demand significantly. As a result, the winery has raised its price in hopes of either separating "the men from the boys" or you from your money. The winery then decided that it needs to be even more profitable that it already is (might they consider abiding by the laws in Sonoma and reduce the amount of fines they're paying to the government there as a result of doing some non-permitted development?). As a result, the 2003 vintage brought a temporary end to retail wine shops carrying Peter Michael wines. Sir Peter issued a statement saying the winery would no longer be selling wine to some of its original customers, in favor of selling directly to consumers. "For the present time," according to the letter. If consumers don't flock to the winery to buy $150 bottles of Les Pavots, Peter Michael may choose to stoop to selling wine to the likes of a shop such as Weimax. UPDATE: With the release of the 2008 vintage coinciding with a 'down cycle' in the economy, Sir Peter's wine once again became available to us. We may still have a few bottles of the 2009 in the shop...it's a nice, big, robust, not-for-the-faint-of-heart Cabernet. With shorter crops in succeeding vintages, Peter Michael cut back drastically on the sale of its wines to their distributors. We understand they may have 60 bottles of a particular vintage with which to accommodate more than a hundred accounts. Good luck. This is a new label for us. 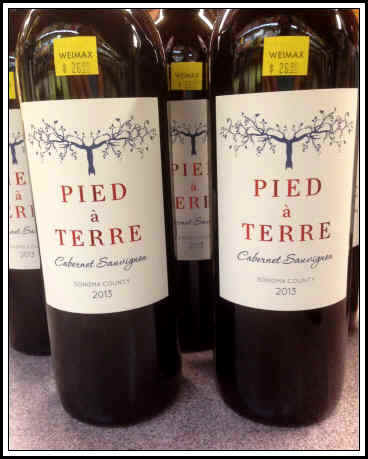 Pied � Terre is a term with a few definitions...it literally means having a "foot on the ground" and certainly this vintner is well-grounded. You'll also find this term used to describe a small apartment or flat in a big city...or it could be someone's home-away-from-home when they're at work. There are some flight attendants who come and go from here in Burlingame and they maintain an apartment over at Northpark so they have a comfortable place to stay when they've land at SFO. A New York sommelier of note, Richard Luftig, was bothered by the lack of good quality and affordably-priced California Cabernet Sauvignon, so he embarked on a winemaking adventure with Napa Valley vintner Steve Matthiason. These days his winemaker is Dry Creek's Clay Mauritson. As a wine guru at Gramercy Tavern in New York and, these days, at Cookshop, Luftig wanted to be able to serve a sensibly-priced wine which offered good quality. Yes, you can find plenty of relatively modestly-priced California Cabernets, but there are not many worth drinking. So, Pied � Terre was born a few years ago. We tasted the new release, a 2015 vintage. This is quite charming and a bit more reminiscent of old-school California Cabernets than today's hit-you-over-the-head, punch-you-in-the-nose sorts of wine. It's one of those wines which transports us old-timers back to the days when California Cabernet was an elegant wine and perhaps even a bit understated. The Cabernet is primarily from Sonoma's Alexander Valley, though there's a bit of Dry Creek Valley fruit here, too. You'll get a hint of wood on the nose, but it's not a heavily-oaked wine. The tannin level is modest, so the wine is quite drinkable now and will even blossom a bit more with several years of aging. It's a shade deeper than the previous vintages, in our view. And you don't need to speak with a mortgage lender or finance agent to buy a bottle.